A farewell "Yippie!" from his friends. 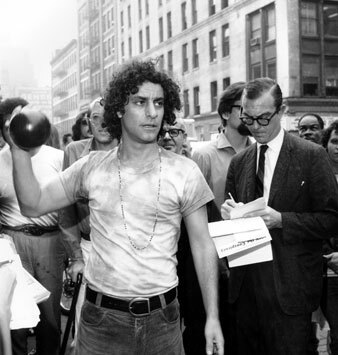 Abbie Hoffman holds a toy bomb in New York City on Sept. 16, 1969. A farewell “Yippie!” from his friends. Abbie Hoffman was one of a kind: an imp, the joker, the Shakespearian fool who sees and suffers, clothing truth with wit. While Abbie was most like Lenny Bruce in his biting humor, his personal demons and his driven relentlessness, he chose again and again to forgo the logic of a Hollywood or professional comedian’s career. He chose every time to hurl his brilliance into an indictment of injustice, hypocrisy and the powers that be. Abbie was a friend as well as a thorn — a goad to do more and be better. I think he most loved the days on the Lower East Side, when he and like-minded anarchists, activists and dropouts staged theater by carrying thousands of bags of garbage on the subway from lower Manhattan to dump at the feet of the rich on the opening night of Lincoln Center, or when they dropped thousands of dollars from the gallery of the New York Stock Exchange. My own favorite was his announcement to the media that on Labor Day, 1969, several hundred Americans would kill themselves in their automobiles in protest against American bombing of Vietnam. Abbie never gave up, never stopped risking himself in the interest of making a better world. He tirelessly educated a new generation of college students, nudging at their internalized sense of limits, challenging them to think that anything is possible. He fit himself into unlikely roles, living underground for several years, coping with jail, almost surviving the 1980s. He acted in concern with mass movements; he acted in the face of the void. Gentle man, existential man, knowing full well the reasons for despair, embodying imagination. He insisted on calling me Bernie, which only my mother is allowed to do. He carried my kids on his shoulders at demonstrations. I knew him best at a low and uncertain time for us both, when I picked him up from a halfway house in Manhattan every morning and took him to his job at a drug treatment program in midtown. I too was newly back in public life. We were companions who made the unspoken assumption that there would be other waves to ride, new mornings. Abbie kept us all laughing, not with the cruel, divisive humor that is typically American — but joking about the banality of the powerful, the ludicrous nature of the human dilemma and the need to keep on pushing. Like all wise men, the child in Abbie kept the incongruities in focus; he used as his motor force the simple assumption that people want to be free. I first met Abbie in the early 1960s when, after he had returned from a stint of voter registration work in Mississippi, he established Liberty House, a New York outlet for knitted and other handmade products by black women in that state. When I walked into the store on Greenwich Village’s Bleecker Street, fresh from representing Freedom Riders in Jackson, I was introduced by a friend to this highly frenetic man who quickly explained to me that he hoped to establish counterparts of his store throughout the North. He never succeeded in doing that, but for the three or four years of its existence Liberty House did manage to return a decent profit to the hundreds of Mississippi women who created its merchandise. Although I didn’t know it then, our first Bleecker Street handshake was to be followed by almost three decades of close contact. Undoubtedly, our most notable encounter was the half-year we spent together as lawyer and client in the 1969-70 Chicago conspiracy trial. In the tumultuous courtroom of Judge Julius Hoffman, I watched with a mixture of amazement and admiration as Abbie, with verve, wit and audacity, managed to hold a vengeful government at bay and eventually wrest victory out of what at first appeared to be a preordained defeat. I have so many memories of what Abbie did in that Chicago courtroom that it is difficult to select any one particular episode over another. I do recall him doing a handstand on the railing that separated the spectators’ section from the well of the court; bringing in a forbidden birthday cake for incarcerated co-defendant Bobby Seale; holding up a placard with attorney Leonard Weinglass’s name correctly spelled on it whenever the judge, as he so frequently did, mispronounced it; and standing nightly on the street outside the Federal building with a sign proclaiming “Free the Jury” when the bus carrying the sequestered panel returned its members to their hotel. The press usually referred to acts such as these as “antics,” but what they really represented was not only the outward manifestation of a truly free spirit but also the emergence of humor and ridicule as highly effective political weapons. In the early 1980s, while still on probation for selling cocaine, Abbie Hoffman came to Duke University and made fun of Smokey the Bear. Which was a crime, he said. One that could have landed him in jail had certain people been watching. A Duke undergraduate at the time, I understood his action to mean that it is important and necessary to take risks for what one believes in, freedom of speech and expression being at issue in that case. So in the spirit of risk-taking, I stood up and invited Abbie back to the student coffeehouse at the end of his talk. Over tea and bagels, with a small, rapt crowd gathered around him, Abbie held forth on his version of participatory politics, and a lively version it was. I remember he was obnoxious, funny and obviously dedicated. The students and activists craned their necks to hear Abbie over the jazz music being played by Brother Yusef on the other side of the room. Yusef, a former heroin addict turned Black Muslim piano virtuoso, was the first person who ever called me “sister.” I asked Yusef if he could turn down the volume, since Abbie Hoffman was visiting. For “Brother Abbie” he’d stop playing entirely, Yusef said, and he joined the circle. Abbie was talking about civil disobedience, about breaking a law and going to prison in order to prevent more serious crimes from being committed. As he spoke about what it was like behind bars, he looked at the young people surrounding him and saw their eyes registering no signs of recognition. Then his gaze met Yusef’s and held. “I hear you, brother, I hear you,” Yusef said, nodding. The understanding that passed between them bowled me over. I realized that night that it was possible to live a political life, to keep on fighting as one grew older, that not all the Yippies had turned into yuppies, no matter what the mainstream pundits proclaimed. Abbie Hoffman spoke to hundreds of students at about fifty colleges every year. If he reached a fraction of them as he did me, at that crucial moment in their political awakening, our loss is enormous. In 1986 I visited Abbie Hoffman, who was living in a cramped New York City walk-up several floors above a manicurist. As we talked, Abbie, who was just about to turn 50, griped about his economic situation. He wasn’t making much money — he showed me his tax returns as proof — and was finding it hard to provide for his family. He knew he had sacrificed big bucks in order to pursue the causes that captured his overactive and unique imagination. In fact, at that time he was turning down lucrative offers for TV commercials and an appearance on Miami Vice. What riled him was the thought that some ill-informed person out there in medialand might not realize that Abbie had not strayed. He shoved a videocassette into his VCR. On came The Big Fix, a movie released while Abbie was underground. In the film, a detective played by Richard Dreyfuss searches for a former radical leader who has disappeared, a character modeled on Abbie. When Dreyfuss finally finds him, the former Yippie is a successful ad man living in a house with a pool in Beverly Hills. An agitated Abbie pointed at the screen: “You get a choice. I could have that. It would take two years.” With his media skills and ingenuity, maybe it would have taken him only eighteen months. But he hid made his choice. Until the very end, Abbie walked it like he talked it. That’s a pretty mean feat. The Student Action Union opened its spring organizing conference at Carleton College in Minnesota on April 14 with the following tribute to A bbie Hoffman, who was a member of its advisory board, it has been shortened here to meet space constraints The Student A ction Union is a national multi-issue organization founded last July in North Carolina at a follow-up meeting to the National Student Convention held in February 1988 at Rutgers University. There was so much happening at the convention at Rutgers that most of us will have a difficult time just remembering, never mind agreeing on, everything that took place. Problems within the student movement were made clear. Debates were framed that rage even to this day. Important alliances and friendships were started. Several organizations, including our Student Action Union, were eventually formed as a direct result of the Rutgers call. But there was at least one moment that almost all of us remember very well. On Saturday night, as it slowly became clear that overall unity was going to be an extremely difficult goal to reach, Abbie Hoffman gave a speech on a special panel. It was a rousing, laughter-drawing, emotional and extraordinarily intellectual plea for us to emphasize our common goals; to remember that our struggle was not with each other but with immoral and unethical institutions and people outside that meeting; to avoid those inner turmoils that have burned out so many young activists over the years; and for us not to be afraid of the power we could find if we could just come together. Abbie talked about many of the vital issues facing us in the late 1980s, but the thrust of his speech was that it had been a long time since students had traveled so far to attempt to achieve something of such historic potential. It had been a long time. And it would have been an even longer time if it had not been for Abbie Hoffman. From the moment the National Student Convention was conceived, right up to his death, Abbie Hoffman spent more time offering us encouragement, advice and even fund-raising help than any other activist of his generation. When students (and journalists) across the United States were asked how they found out about the convention, the reply we heard more often than any other was: “from Abbie Hoffman,” Along with his other endeavors, Abbie gave his heart and soul to see a new national student organization develop into something that could be a real force to help bring equality, justice, radical change and real humanity to this country. People all across the world will remember Abbie’s incredible life. But it is especially up to us, the students and youth who received Abbie’s special encouragement and teaching, to keep his spirit alive. It is especially up to us to continue the kind of work and struggle that was indivisible from his life. We are proud to call Abbie Hoffman a hero and mentor, and honored to have been able to call Abbie Hoffman a friend. Many of us in the Student Action Union would like to dedicate our efforts at this conference and in the future to Abbie Hoffman. Abbie, we miss you and we will always love you.